Imagine the possibility of accessing online content from anywhere on Earth. Kymeta’s new mTenna® technology makes this one-time dream a reality. The software used in mTenna technology tracks low earth orbit (LEO) and medium earth orbit (MEO) satellites to stay connected. Because the technology is so lightweight, it means the Kymeta antennas will be more durable, lighter and faster to install – opening up a host of potential applications across sectors like the automotive, aviation and maritime industries. Kymeta-Panasonic Avionics Corp. partnership: Panasonic will order a “significant volume” of Kymeta’s mTenna to be used for maritime vessels. While antennas usually have to be put on ships by crane, the mTenna can be “put on by hand,” according to Kymeta Chief Commercial Officer Bill Marks. Kymeta announces satellite-communications partnership with Toyota: The partnership was announced at the January 2016 North American International Auto Show. 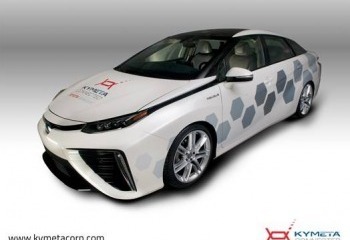 The partnership demonstrates both companies’ commitment to innovation, as Toyota hopes to install mTenna technology in its research car based on the Toyota Mirai fuel cell vehicle. KymetaConnected tours the United States: The Toyota 4Runner, equipped with mTenna technology, toured the U.S. to showcase the utility of connectivity everywhere. The tour ended at the Gaylord National Resort and Convention Center in Washington, D.C. where Kymeta hosted a Surf and Turf Party on the Potomac for industry partners. Want to learn more about Kymeta’s news? Follow them on Facebook, LinkedIn and Twitter. CEO and founder Nathan Myhrvold said, “Every great idea starts off as a spark. We live in a society that has been completely technologically transformed by ideas that worked out.” Our favorite links this month tell stories of inventors and inventions that embody that kind of transformation.